Home › TV › Why is 2-18 (February 18th?) On the Field of the Alabama vs Georgia Championship Game? Why is 2-18 (February 18th?) On the Field of the Alabama vs Georgia Championship Game? 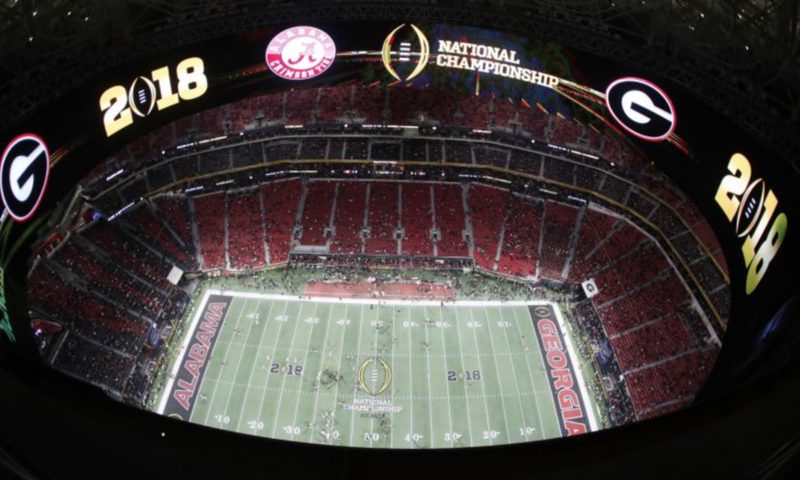 If you are watching the College Football Playoff (CFP) National Championship Game you have likely noticed the use of 2-18 on the field, on the jerseys and several other places. So, why is NCAA or college football promoting February 18th? It is not. This is actually the graphic for 2018 with the 0 being the top of the CFP National Championship. It is a football with the laces in the middle making it look like a dash. You will see this at the Mercedez Benz Stadium or “new” Georgia Dome for the entire championship night. This is not something political. It has nothing to do with Donald Trump being at the game. It is not promoting anything that is going on in February. Did you think the field or the jerseys said 2-18? When did you figure out it was 2018? It is a horrible design!! It makes no fricking sense. It 2018 and that is the best they can do? I did not “figure out it was 2018”. If you figured it out, why would you look it up?